仏法僧 literally means: Buddha, Teaching and Priests, the three treasures of Buddhism, so the bird is also called: sanpoodori 三宝鳥, bird of the three treasures, another kigo. In Japanese we have the proverb "To use one stone to kill two birds, for short: one stone two birds" (isseki nichoo　一石二鳥), but in this context we could say with a smile "One word, two birds". The dollarbird lives in the deep forests of remote mountain areas, where the old holy mountain retreats like Mt. Koya (Koya San in Wakayama), Nikko, Kiso and others were located. It is very shy. Its voice was heard at night in the far-away woods as the sound of: bupp poo soo, bupp poo soo, hence the name in Japanse. Only during the beginning of the Showa period did it suddenly become clear that the voice of this bird is in fact different, like gyaa gyaa. 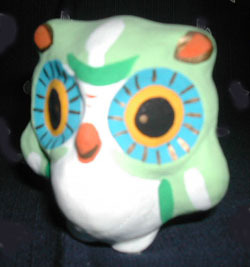 And the originator of the sound bupp poo soo was in fact a kind of owl, see below. the owl the "voice of the bird" (koe no buppoosoo　声の仏法僧). The dollarbird, Eurystomus orientalis (family Coraciidae) , is a dark roller with blue on its wings, tail and throat and a red bill. It has bluish-white windows or "dollars" on its wings which are visible in flight. 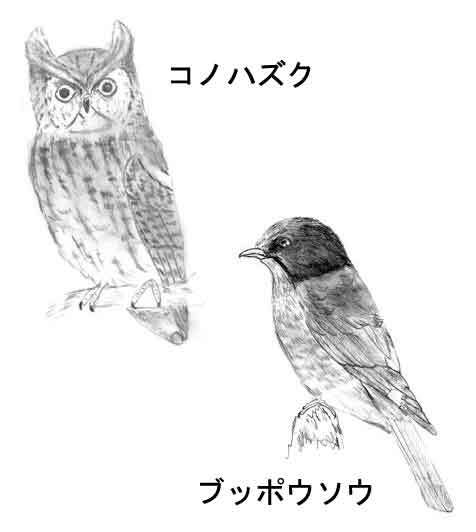 is believed to be the smallest of all Japanese owls. It is only as large as a pigeon. 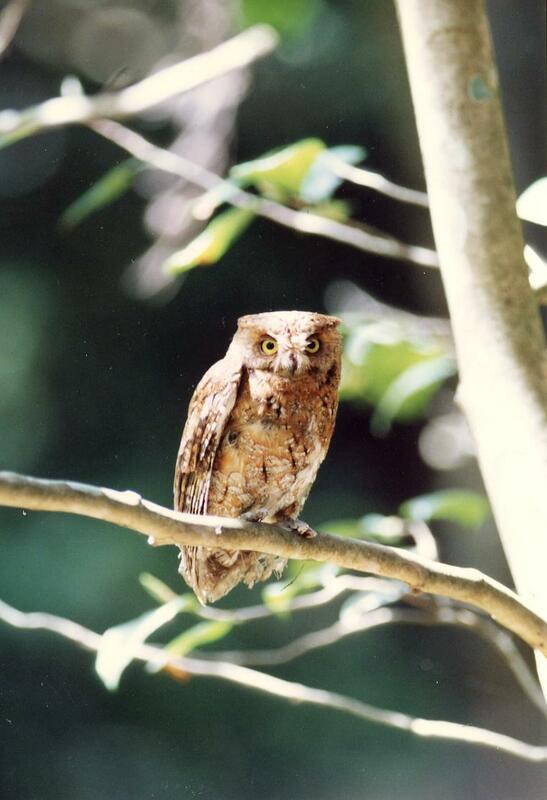 It belongs to the family of Eurasian Scops-Owls. Also called "owl in green leaves" aobazuku　青葉木莵. The spelling "aobaduku" is problematic. Click HERE to see more photos of this bird. A souvenir toy and mascot of the town of Horai. Made from a kind of reed.
. Buddha Bird at Mount Kashozan, Gunma .